Dave's Reflections » Blog Archive » Cognitive Corporation™ Innovation Lab Kickoff! « State Selection Lists on Website Forms – How Hard Are They to Sort? From an implementation perspective we have a core execution team of 8 individuals assigned as owners across Requirements, BPM, BRM, Data Mining, Semantic Technology, Relational Database Technology, and Application Architecture. Scrum will be used as the lifecycle for the lab projects. Beyond the deep expertise provided by our team, I’m excited by the energy and excitement that the execution team members bring to the lab. A separate advisory team has also been established. This group will provide a sounding board as the sprints complete and new stories are considered. It will also serve as a pool of team members to swap into the execution team since these folks will be in the loop with the ongoing projects. 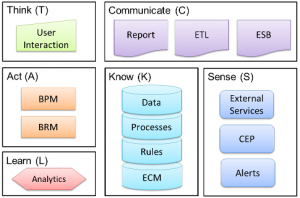 The tools we will use are enterprise solution components including workflow and rules engines, web service and message-based middleware, traditional relational database management systems, data mining tools and semantic technology such as an ontology editor, reasoner, triple store and SPARQL endpoint. We are creating an architecture with components similar to what we find our clients using, augmented with less common components such as predictive modeling tools and semantics. The lab’s goal is to advance our company’s expertise with these enterprise tools and techniques, providing insight regarding best practices for leveraging them as components of a learning system. 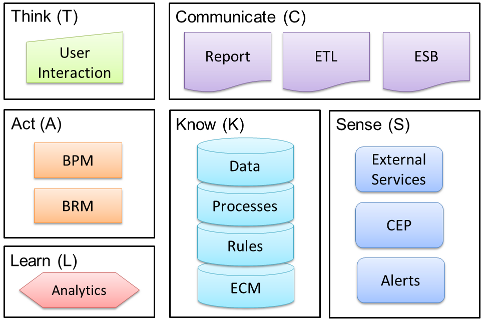 Methods for dynamic interactions between components such as predictive analytics driving business rules changes or semantic technology simplifying data integration will be tried, honed and ultimately become part of Blue Slate Solution’s best practices for advancing the value of BPM within our clients’ enterprises. As part of our process, we will be sharing updates, both from individual team members through blog entries and also in general communications highlighting the overall progress and outputs from the lab. We all hope that others will find the information thought provoking and educational. If you have thoughts about what we are undertaking, or would like to learn more about it, please feel free to send an email to info@blueslate.net. This entry was posted on Friday, August 10th, 2012 at 23:24	and is filed under Architecture, BPM, Business Processes, Business Rules, Cognitive Corporation, Data, Data Analytics, Information Systems, Semantic Technology, Software Composition, Software Development, Tools and Applications. You can follow any responses to this entry through the RSS 2.0 feed. You can skip to the end and leave a response. Pinging is currently not allowed.